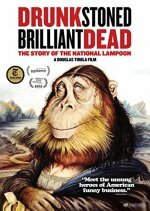 Drunk, Stoned, Brilliant, Dead: The Story of the National Lampoon release date was Friday, September 25, 2015. Amid the seismic cultural shift of the 1970s, American comedy got a sharper edge when a newly minted magazine named National Lampoon stuck its middle finger up at the establishment. Spawned at an Ivy League school by the wonderfully warped minds of Douglas Kenney and Henry Beard, National Lampoon rose from a counterculture rag to a revered comic institution. Bound by a passion for the absurd and a mistrust of authority, Lampoon's irreverence spanked nearly every available social taboo from weak-kneed politics to heated racial tensions. This unique cocktail of high satire and gallows humor exploded onto America's cultural consciousness attracting visionary talents such as Gilda Radner, John Belushi, Bill Murray, and Chevy Chase, whose comedic force helped expand the magazine's spirit to stage and film. Director Douglas Tirola unearths never-before-seen archival footage and brilliantly weaves it together with the magazine's beautiful and often shocking art, reliving National Lampoon's meteoric rise from go-to magazine of the counterculture to a brand synonymous with Hollywood's biggest comedies.